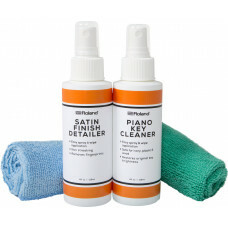 Keep your Roland satin-finish digital piano looking its best with the premium care kit. Includes a special satin-finish detailer, a key cleaner, and two microfiber cleaning cloths. A blend of quality ingredients help keep your instrument looking new. Specially formulated for satin finishes, the detailer safely cleans and protects without leaving a shine. Keep your piano keys fresh and comfortable with our specially formulated key cleaner. Safely removes fingerprints and dirt from any keyboard without leaving a residue. High-quality microfiber cloths remove dirt and dust without harming or scratching the surface.